I’ve been so busy with book promotion, I haven’t had a chance to give you all a report on my trip back to Princeton for my 25th Reunion. I’m pretty sure the twenty-fifth is the most attended reunion for Princeton graduates. I didn’t check statistics, but when I signed the book, the number of attendees was close to five hundred, about half of the graduating class. And we’re not just talking a dinner with some speeches. Reunions weekend started on Thursday, May 29 with a public service project and ended on Sunday, June 1 with a nice brunch in the brand-new Whitman College dining hall with made-to-order omelets and plenty of roasted asparagus left over from the Italian dinner the night before. 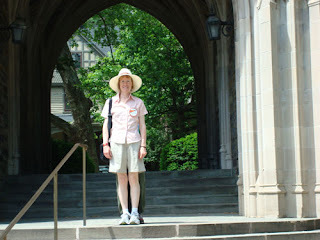 In between, I showed my kids the lovely Princeton campus—with many new additions since my day. We attended some great talks like the panel with prominent Princeton alum journalists, including Todd Purdham who later appeared on the JetBlue TV screen on our return trip, defending his hard-hitting expose of Bill Clinton (Purdham seemed like such a sweet man!) in Vanity Fair. We went to the Triangle Show, where I once worked stage crew back in the day, and I have to admit it’s gotten much funnier and edgier than when an old vaudeville guy named Milton directed the show with the conservative tastes of the old alums foremost in his mind. The climax of the weekend was of course the P-rade, where our great class of 1983 led the way through the main gate and on down through campus to the soccer field in our new orange and black blazers, to be followed by contingents from the major reunions and finally the frisky class of 2008, who were learning how to be Princeton alums before they'd even graduated. Princeton is after all a lifetime commitment. I can’t leave out mention of the food, which is also improved since my days working reunions. I remember steak, baked potatoes and limp green beans. For dessert, frozen cheesecake, which I remember prying apart and putting on plates as part of my duties. 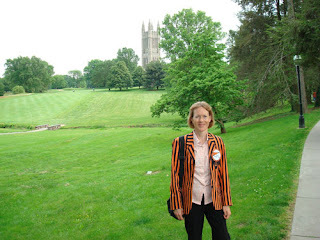 I liked working reunions because the alums would wink at me and say, “golly, I wish we had girls at Princeton back in my day.” By coincidence as James and I were walking out to the class dinner at the bucolic grad college, an older alum called out cheerily to us, “that's a good-looking jacket…and a good-looking wife.” Perhaps I should have been offended, but it all seemed charmingly nostalgic instead. But back to the food…so instead of steak we had chicken breast with mango salsa and grilled vegetables and green beans steamed al dente with feta cheese and cherry tomatoes. The cheesecake was still on the menu, but one had several choices—chocolate cherry or oreo cookie or lemon. Breakfast sucked though—just bagels and muffins, coffee and juice. My body can’t take a carb-only start to the day any more….I’ll talk more about the delicious reception at my eating club in another post, which I came to realize, is the real root of my foodie flowering. I’ve covered buildings and food, but, yes there were people at reunions, too. Besides a contingent of roommates I’ve kept in touch with regularly over the years, I did get a chance to chat with some friends I haven’t seen in many years. I even sold a few of them a copy of my book, although once at Princeton I felt suddenly shy about broaching the subject with people who knew me before I turned into Dr. Erotica. My most surprising and fun sale was to the fiancé of a friend of my roommate, a therapist who told me to sign the book “to the guy I just met, thanks for the $8.” And I did. Perhaps strangest of all is that I discovered my college age self is still alive inside me. She still dislikes loud, big parties that reek of beer but also finds they fill her with that same bittersweet sense of yearning. She still recognizes so many faces among her classmates and wishes she could know more of them better but doesn’t have the courage to make the first move. She’s still able to endure the hardships of college life with aplomb—bunk beds, bathrooms down the hall, public laundries (although in Whitman College they are inside and FREE!) She still finds Princeton achingly beautiful and yet somehow remote, just out of reach, but always promising something, something she can never quite grasp. Another interesting note—the class of 1983 is on the same reunion schedule as the class of 1973, the first Princeton class to have women graduates who’d attended all four years. Now they have two styles of reunion jackets, the regular boxy cut for men, a tailored style for women. Princeton really does do quite a job with their reunions. Three and a half days of dinners, parades, dancing, drinking, air-kissing. I wonder if any other college puts on such a long, elaborate party? Has anyone else gone back to a college reunion—and what was it like? Were you glad you went? I am glad I went, but I don’t see myself going back to Old Nassau until my fiftieth if I make it that long. 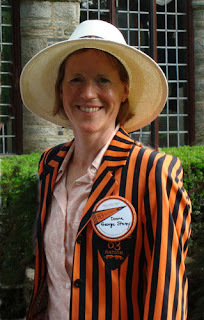 Until then I’ll put my orange and black jacket and straw hat in storage (to be taken out for Halloween now and then). But between now and then I’ll no doubt think of Princeton—as lovely a setting as you could ask for to endure your adolescent angst. Hey, "tiger," I think you and I are actually in the same eating club.